It’s back. Our televisions are once again graced with what is fast becoming a national institution, as languid and gentle as a relaxing late summer Sunday. 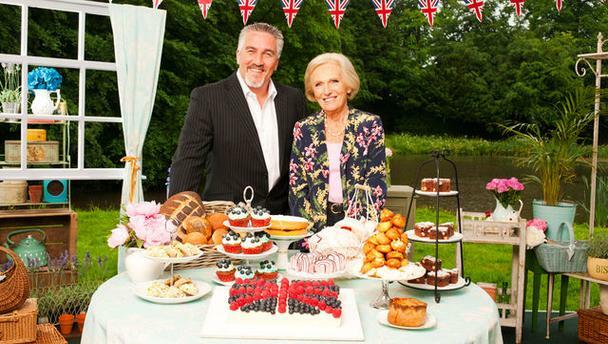 But testing recipes, failed soufflés and fraying nerves make The Great British Bake Off as challenging as a special forces selection course, and compelling viewing to boot, all served up with a wit as sharp as a lemon drizzle. To honour this welcome return to our screens, we have a significantly simpler offering to get us geared up for a bit home baking ourselves; Alabaman Elizabeth Draper has recently been commissioned to create cakes and other delights for Cafe W, Waterstones’ own coffee shops. 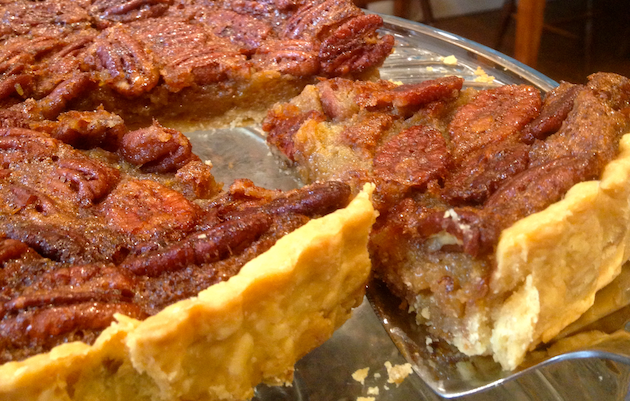 Here, for The Arb, she conjures up her grandmother’s signature dish, the inspiration for her own baking: pecan pie. I am from Alabama but have lived in London for over 25 years. Pecan pie is a Southern staple but over the years I have watched it appear all over London, from high street patisseries to supermarket chains (not to mention the obligatory inclusion on every American diner menu). Yet, I had the pleasure of watching an American ex-­pat cry when she tasted my pie in Brick Lane last summer because it had been so long since she’d had the ‘real deal’. The real deal is a very simple affair. A pecan pie is sweet, soft and gooey in the middle, offset by the nuts and a buttery (not sweet) thinly rolled crust. Use a deep pie pan for best result, the ceramic ones from Le Creuset work well. My grandmother used a plain pyrex pie dish but they are hard to find here with a tapered edge. A flan or tart tin also works as long as it is not too shallow. 1. By hand, combine the flour, salt and butter until they are the consistency of coarse breadcrumbs. Add 1-­‐2 teaspoons of ice water until the pastry comes together. Don’t knead or over-­handle it. Wrap it in greaseproof paper and chill for one hour. 3. Roll the pastry out and line a 23cm pie dish, creating a pattern on the edges by pinching the dough or just level off for a tart tin. 4. Line the pie with baking paper and beans and blind bake for 10 minutes. Remove the beans and paper, bake for another 5 minutes then remove from the oven and set aside while you make the filling. 1. Combine the filling ingredients, pour into the pie dish and bake for 30–40 minutes, until the pie is set and golden on top. It shouldn’t wobble but you don’t want the nuts to get too dark. Cool and serve with ice cream or crème fraiche. *I use Karo light corn syrup which is a US import now available through Ocado, Amazon & some Tescos. Substitute golden syrup or maple syrup if required. Pecan pie and other confections, from old-fashioned baked cheesecake to blueberry lemon cake and salted caramel brownies, are available in Waterstone’s ‘Cafe W’ in Piccadilly, Richmond and Greenwich, and are soon to be rolled out in other branches of the bookshop. 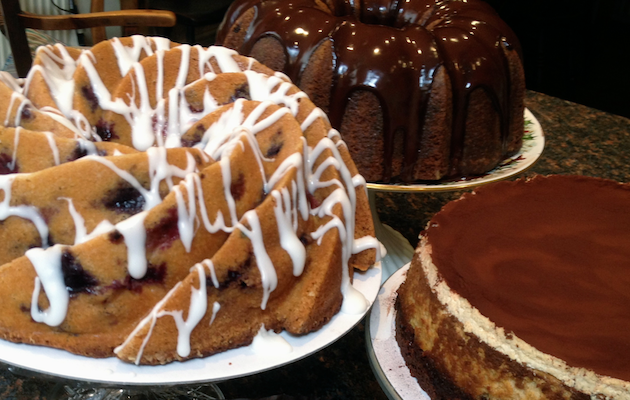 For more information about Lizzie D’s Bakery, visit the website.